Hi my name is Mark Bland. 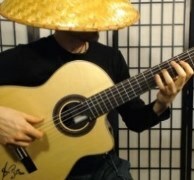 I jumped onto this forum to be able to collaborate more with some interested in flamenco guitar. I first was exposed to flamenco while living in Triana, Sevilla with a family in 1985. I had already been a guitar play since about 10 years old, but was hooked from that time forward. Bought myself an Alhambra guitar for $230 and been playing since. Yes that was 34 years ago when La Carboneria was not a huge tourist spot. I am not a professional musician but just love to play flamenco guitar. I lived in Barcelona 3.5 years as well way back in 89-92". Gotta run - I play for the local dance classes on the weekend. Where do you live, hombre? I live the middle of the US - Kansas City, Missouri. Lots of good Jazz here. Come to Nashville, TN. We'll jam.